Another successful year of Galeria Solna! 2015 has proven to be again enormous success for Galeria Solna. 10 mln visitors by February 2016, the occupancy increased to 100%, the average turnovers increase of 17%, the average OCR% decrease of 11,8% and the operational costs were further reduced. – We are very happy to introduce to our clients another, strong brands, so far not available for residents of Inowrocław and the region like Media Markt or Gino Rossi, strengthening our position of the most favorable meeting place in Inowrocław – says Monika Swynar, Galeria Solna asset manager on behalf of the owners, Libra Project and Acteeum Group. – Another year of Solna’s success is underlined by the growing footfall being 5% higher comparing to last year, increasing turnovers and average basket, still the low number of tenant replacements and the number of interested retailers, willing to join the scheme. 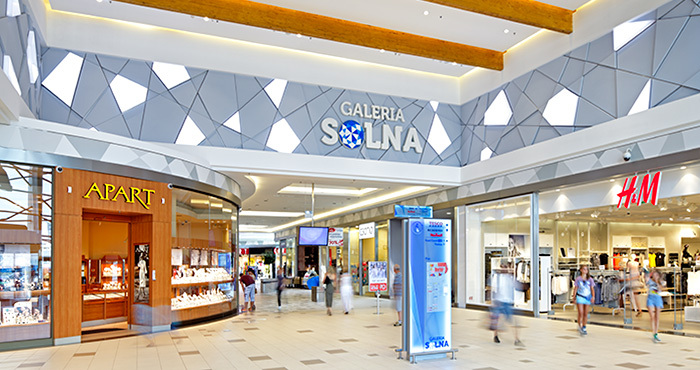 Galeria Solna is the only place in Inowrocław offering both a shopping and an entertainment experience for the residents of the city and the region. Solna opened on May 8, 2013 and was awarded for its architecture a fine tribute to the famous Solanki Spa area in the city. The importance of Galeria Solna for the region with around 200,000 inhabitants was immediately recognized. This success contributed to the number of signed new agreements with long-term tenants, to the last available units in the center which now enjoys nearly 100% of occupancy. Among the tenants who opened their stores in Solna in 2015 are Media Markt, Pepco, Gino Rossi, Eurobank, Remarco bakery, restaurant Oregano, extension of Big Star. Apart from strengthening the retail and services offer Galeria Solna is optimizing its energy consumption and reducing the operational costs of the building. 2015 recorded nearly 1% savings on service charge costs. – Galeria Solna is often an award winner for both its architecture and important for the region. In 2015 Galeria Solna was awarded by the Polish Council of Shopping Centers in category of a “New Shopping Centre of the Year 2015”. However we pay special attention also to the ecological standard of our asset and in this respect the object has recently also received a prestigious “Final BREEAM Certificate” at the level “very good” constituting about energy efficiency and environmentally friendly solutions used in the building. The auditors assessed Galeria Solna in ten categories: management, health and well-being, energy, transport, water materials, waste, land use and ecology , pollution and innovation . In all these categories Galeria Solna meets the given requirements and this is the direction we will definitely keep also in the future – adds Monika Swynar. The Gallery’s regularly carried out marketing activities (contests, workshops, events pro-sales, loyalty programs, exhibitions) link the world of entertainment and culture with the world of fashion. Throughout the year over 43 events were organized, 5 outdoor campaigns. The greatest interest among the residents of the city and the region still draw the “shopping nights” organized twice a year. The Spring edition brought 13% footfall increase comparing to last year. Almost 80% of all tenants actively take part in the Shopping Nights by offering special discounts. Other events recorded substantial increases as well and the City of Inowrocław also organized its annual job offer “Targi Młodych” fairs event in Galeria Solna.